Rebel and terrorist organizations could get their hands on a next-generation grenade launcher, the LG5, which the Chinese regime will begin selling. The Chinese regime is promoting the LG5 as an “anti-sniper” weapon, but has other uses. It’s key feature is its “airburst” grenades which have programmable fuses, so they can detonate overhead and kill entrenched targets. 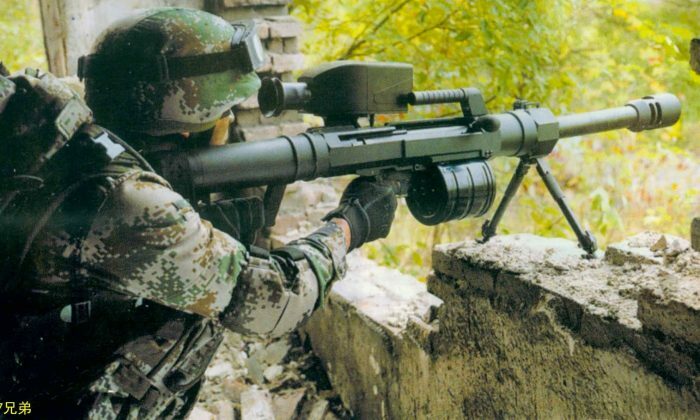 The LG5 appears to be an upgraded version of the Chinese regime’s QLZ87 grenade launcher. If its current exports of the QLZ87 say anything, the LG5 could end up in the hands of several unsavory groups—from foreign militaries, to rebel groups, to terrorist organizations. Among the groups currently using the Chinese QLZ87 grenade launcher are al-Shabaab in Somalia, rebel forces in Syria, Khartoum-backed Chadian rebels, and the Sudan People’s Liberation Movement–North, according to a 2014 report from Armament Research Service, an Australian arms and munitions consultant group. It will export a version of the LG5 that uses 35mm rounds. A 40mm round version will only be used by Chinese forces. New images of the weapon recently appeared online. Chinese military watchers reposted the images for online discussion. Technology for airburst grenades is still very early. The showpiece weapon for the concept until now was the M25 (previously called the XM25 Counter Defilade Target Engagement) weapon, still being tested by U.S. and German troops. The M25 bullpop grenade launcher is supposed to enter official use by U.S. forces by the end of the year, yet is facing setbacks due to cuts in military funding. The Chinese regime’s plan to sell the weapon means that Chinese forces, and their broad list of approved customers, will have a next-generation weapon that can spot and kill snipers, kill troops under cover, and destroy light vehicles. The new LG5 shares the same basic shape as the QLZ87. It shares a similar clip, and appears to be around the same size. According to the Armament Research Service report, the LG5 is “based on an existing .50 caliber anti-material rifle design.” When fired, its barrel recoils into its receiver. It appears to be semi-automatic. Key features of the new rifle are a fire control unit with a laser range finder and a muzzle brake that, according to the report, “may incorporate an electronic fuse programming module.” Combined, the features will allow a soldier to see the distance of a target, and set a timer on the grenades to detonate at the distance. The LG5 will also allegedly have thermal imaging, which will highlight living targets that emit heat. The People's Liberation Army's capabilities are severely hampered by corruption caused by lack of civil oversight and Communist Party control. The Chinese regime has revealed its systems for cyberwar, which include hacker units in its military, its government, and in its public sphere. For more than a decade, a Chinese cyberspy group has targeted governments and journalists in up to 17 countries.